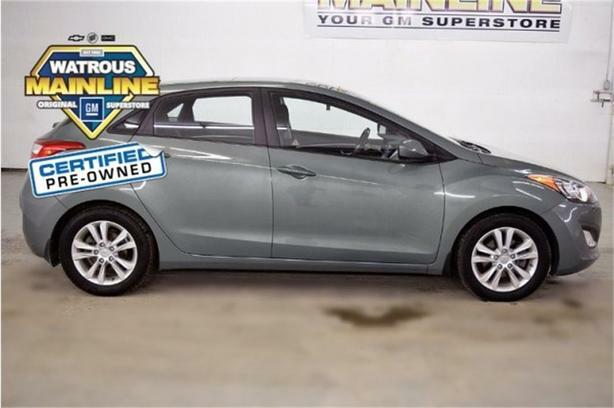 Come see this certified 2013 Hyundai Elantra GT GLS. Its Manual transmission and Gas I4 1.8L/110 engine will keep you going. This Hyundai Elantra GT has the following options: XM satellite radio, Windshield sunshade band, Warning lights -inc: oil pressure, coolant temp, battery charge, door ajar, airbag, seatbelt, low fuel, parking brake, brake fluid, check engine, ESC, ABS, hatch open, Vehicle stability management (VSM), V-beam rear stabilizer bar, Variable intermittent 2-speed windshield wipers, Trip computer -inc: distance to empty, average fuel consumption, average vehicle speed, elapsed time, Torsion axle rear suspension -inc: coil springs, mono-tube gas shocks, Tinted glass, and T125/80D15 compact spare tire. Stop by and visit us at Watrous Mainline Motor Products Ltd, 208 1st Avenue East Box 70, Watrous, SK S0K 4T0.